1. The branch of medicine concerned with the treatment of disease, injury, and deformity by physical operation or manipulation. 2. The performance or procedures of an operation. 1. the branch of medicine that treats diseases, injuries, and deformities by manual or operative methods. 2. the place in a hospital, or doctor's or dentist's office, where surgery is performed. 4. the work performed by a surgeon. antiseptic surgery surgery using antiseptic methods. aseptic surgery that performed in an environment so free from microorganisms that significant infection or suppuration does not supervene. conservative surgery surgery designed to preserve, or to remove with minimal risk, diseased or injured organs, tissues, or limbs. dental surgery oral and maxillofacial s.
general surgery that which deals with surgical problems of all kinds, rather than those in a restricted area, as in a surgical specialty such as neurosurgery. major surgery surgery involving the more important, difficult, and hazardous operations. minimally invasive surgery surgery done with only a small incision or no incision at all, such as through a cannula with a laparoscope or endoscope. minor surgery surgery restricted to management of minor problems and injuries. Mohs' surgery see under technique. oral and maxillofacial surgery the branch of dentistry that deals with the diagnosis and surgical and adjunct treatment of diseases and defects of the mouth and dental structures. plastic surgery surgery concerned with restoration, reconstruction, correction, or improvement in shape and appearance of body structures that are defective, damaged, or misshapen by injury, disease, or growth and development. radical surgery surgery designed to extirpate all areas of locally extensive disease and adjacent zones of lymphatic drainage. stereotactic surgery , stereotaxic surgery any of several techniques for the production of sharply circumscribed lesions in specific tiny areas of pathologic tissue in deep-seated brain structures after locating the discrete structure by means of three-dimensional coordinates. 1. The branch of medicine that deals with the diagnosis and treatment of injury, deformity, and disease by the use of instruments. a. Treatment based on such medicine, typically involving the removal or replacement of diseased tissue by cutting: The athlete had surgery on his knee. b. A procedure that is part of this treatment; an operation: The doctor performed three surgeries this morning. 3. An operating room or a laboratory of a surgeon or of a hospital's surgical staff: How long has the patient been in surgery? a. A physician's, dentist's, or veterinarian's office. b. The period during which a physician, dentist, or veterinarian consults with or treats patients in the office. the branch of medicine concerned with diseases and trauma requiring operative procedures. surgical, adj. An intervention in which a body site is accessed via an incision on a mucocutaneous surface, most commonly the skin, and tissue excised, added to or manipulated to manage an injury, or to revise or renovate a failing part or aesthetically enhance the tissue’s owner. A place where a doctor, dentist or other healthcare practitioner treats or advises patients. 1. That branch of 'procedural' medicine which addresses physical defects and/or acquired lesions by operative design. 2. Any procedure to remove or repair damaged tissues or diagnose disease. See Abdominal surgery, Band-Aid™ surgery, Beating heart surgery, Billboard surgery, Brain-graft surgery, Cancer surgery, Cataract surgery, Cardiothoracic surgery, Cardiovascular surgery, Chemosurgery, Conservative surgery, Cosmetic surgery, Cranial base surgery, Craniofacial surgery, Debulking surgery, Dermatologic surgery, Dry run surgery, Disfiguring surgery, Elective surgery, Emergency surgery, Esthetic surgery, Facial plastic & reconstructive surgery, Functional (endonasal) endoscopic sinus surgery, Ghost surgery, Hand surgery, Hand-assisted laparoscopic surgery, Head & neck surgery, Heart port surgery, Heroic surgery, Image-directed surgery, Keyhole surgery, Kiss of death surgery, Laparoscopic surgery, Laser surgery, Love surgery, Lung-reduction surgery, Major surgery, Mastoid surgery, MIDCAB surgery, Minimally invasive surgery, Minimally invasive cardiac surgery, Minimally invasive valve surgery, Minor surgery, Mohs surgery, Mutilating surgery, Neurosurgery surgery, Nintendo® surgery, No problem surgery, Open heart surgery, Optional surgery, Outpatient surgery, Palliative surgery, Perineal surgery, Phonosurgery, Port access surgery, Psychosurgery, Radiation surgery, Radical surgery, Radioimmunoguided surgery, Reconstructive surgery, Re-do vascular surgery, Refractive surgery, Required surgery, Robotic surgery, Roller ball surgery, Same-day surgery, Second-look surgery, Stereotactic radiosurgery, Thoracic surgery, Tommy John elbow surgery, Unnecessary surgery, Urgent surgery, Videotaped surgery. 1. The branch of medicine concerned with the treatment of disease, injury, and deformity by operation or manipulation. 2. The performance or procedures of a surgical operation. 1. The treatment of disease, injury and deformity by physical, manual or instrumental interventions. 2. The diagnosis of conditions treated in this way. 3. The practice of operative treatment. 4. A room or suite used for medical consultation and treatment. From the Greek cheirourgia , hand work, as in cheir , hand and ergon , work. n medical procedure in which the body is manually cut open to treat medical conditions. 1. Branch of medicine concerned with treatment of disease, injury, and deformity by physical operation or manipulation. 2. Performance or procedures of an operation. n work performed by a surgeon. n a full-thickness or split-thickness flap created for the purpose of gaining access to the alveolar bone when surgical remodeling is indicated. n a surgically created flap of gingival tissue that is repositioned apically to maintain or create a functionally adequate zone of attached gingiva. In the surgical procedure the existing attached and free gingiva is detached by employing a reverse bevel incision and apically repositioning the flap. n surgery whose purpose is to improve external appearance rather than general health. n a flap in which all the soft tissue elements are raised and repositioned, as opposed to the split-thickness flap. n surgical procedure designed to retain a functionally adequate zone of gingiva after surgical pocket elimination, create a functionally adequate zone of attached gingiva, alter the position of or eliminate a frenum, or deepen the vestibule. n an increased band of attached gingiva created by preparing a narrow papillary flap (to avoid donor site radicular recession), which is then rotated 90° and sutured into the prepared recipient site. n the therapeutic surgical measures used and designed to eliminate osseous deformities by means of ostectomy or osteoplasty or create a favorable environment by means of meticulous removal of the soft tissue contents of the infrabony osseous defect for the formation of new bone, periodontal membrane, and cementum to fill in the area of bone resorption. 1. that branch of veterinary science which treats diseases, injuries and deformities by manual or operative methods. 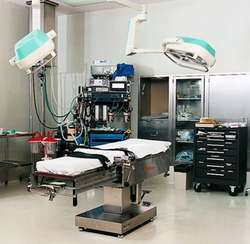 2. the place in a hospital, or doctor's or dentist's office where surgery is performed. 3. in some countries a room or office where a veterinarian sees and treats patients. the collection of instruments, wrapped, sterilized and ready for use in the majority of uncomplicated surgical procedures. The choice of instruments may vary from one surgeon to another, but generally there are tissue forceps, thumb forceps, sponge forceps, hemostats, towel clamps, scalpel handle and needle holder. Scissors and needles may be added after cold sterilization. surgery performed on an organ that has been removed from the body, after which it is reimplanted. that performed with traditional cutting instruments; to distinguish from cryosurgical and electrosurgical methods. performed to improve the appearance, or change the appearance, of the animal; surgery that is not necessary for the health of the animal. Other than ear cropping and tail docking, where performed, generally discouraged or considered unethical for animals as it is usually done for purposes of improving their appearance in the show ring or to disguise traits that might be heritable. surgery carried out at a time convenient to client and surgeon. The opposite of emergency surgery. Distinctly different to cosmetic surgery. that carried out as part of a planned experimental protocol, usually on animals selected specifically for the purpose and which are often sacrificed afterwards. Increasingly, use of animals in this way is under the control of institutional or governmental authorities. that concerned with the restoration, reconstruction, correction or improvement in the shape and appearance of body structures that are defective, damaged or misshapen by injury, disease or anomalous growth and development. transplanting of tissues or organs from another host. Not commonly undertaken in veterinary surgery. Chinese expert consensus on cytoreductive surgery and hyperthermicintraperitoneal chemotherapy for peritoneal malignancies. It has long been held as a central dogma that primary cytoreductive surgery (PCS) is the preferred initial treatment for women with newly diagnosed ovarian cancer. Among 594 women with advanced ovarian cancer treated at one of six major comprehensive cancer centers, median overall survival (OS) for women with stage IIIC cancers treated with neoadjuvant chemotherapy (NACT) was 33 months, compared with 43 months for women treated with primary cytoreductive surgery (PCS), reported Larissa A.
sup] In Cases II and III, no obvious complications of cytoreductive surgery with HIPEC occurred within postoperative 30 days. Role of laparoscopy to assess the chance of optimal cytoreductive surgery in advanced ovarian cancer: a pilot study. Anesthesia considerations during cytoreductive surgery and hyperthermic intraperitoneal chemotherapy. Cytoreductive surgery plus hyperthermic intraperitoneal chemotherapy for pseudomyxoma peritonei arising from urachus. Peritoneal mesothelioma treated by cytoreductive surgery and intraperitoneal hyperthermic chemotherapy: results of a prospective study. Oulu University Hospital is searching a hyperthermia perfusion pump suitable for open HIPEC (hyperthermic intraperitoneal chemotherapy) after cytoreductive surgery for perioneal malignancies. The company said it would pay for part of the cytoreductive surgery with hyperthermic intraperitoneal chemotherapy, known as HIPEC. Often an improper incision is made the bowel is not adequately prepared or the surgeon is confronted with the need to perform an unplanned cytoreductive surgery. The Welsh Health Specialised Services Committee (WHSCC) said cytoreductive surgery and heated chemotherapy, which forms the treatment for patients with pseudomyxoma peritonei, is not routinely commission by them.